Gregg Berhalter, who has identified left back as a position at which the U.S. men's national team has a depth problem, lost his most experienced player at the position. Greg Garza (foreground) departed training camp in Chula Vista, California, after being diagnosed with a low-grade quadriceps strain. 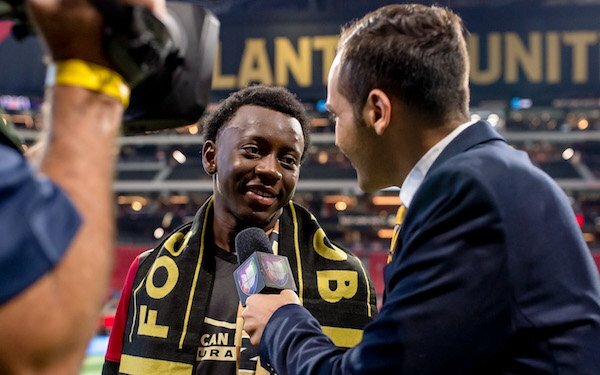 The 27-year-old defender started on Atlanta United's 2018 MLS Cup championship team but was traded to FC Cincinnati in the offseason. He will return to Cincinnati for treatment. Garza (10 caps) will not be replaced on the U.S. camp roster, which now stands at 27 players and includes two uncapped players as options at left back. Montreal Impact defender Daniel Lovitz should be first in line to step in at left back at the camp, but San Jose's Nick Lima has played both outside back positions. They are 27 and 24, respectively. Six other players got starts at left back in 2018. Antonee Robinson led with four starts but struggled defensively and hasn't played for Wigan Athletic since undergoing ankle surgery in November. There are several promising players coming down the pipeline, but they are all teenagers. Chris Gloster, 18, has already promoted from Hannover 96's U-19s to its second team in his first season in Germany. Matt Real, 19, captained the U-20s through much of the 2018 Concacaf championship and is expected to get first crack at starting for the Philadelphia Union on the backline with Auston Trusty and Mark McKenzie, who are both in the national team camp. Edwin Lara, 19, has returned to the U.S. youth program after playing for Mexico at the 2015 Under-17 World Cup. Perhaps the best left back prospect is the youngest. George Bello (photo) turns 17 on Tuesday. He made three appearances last season for Atlanta United and scored one goal. His emergence was one reason Atlanta United traded Garza to FC Cincinnati. 6 comments about "U.S. men's left back: Jinx hits again -- though there is promise down the pipeline". Bob Ashpole, January 18, 2019 at 10:53 a.m. There are fewer left-footed and 2-footed players than right-footed players. There is no special problem with filling the left back position. Coaches face the same problem with all left side positions. It is just that most coaches give priority to filling the positions in front of the left back first. In the modern game (meaning since the advent of attacking fullbacks 2 generations ago) fullbacks and wingers need the same skills. The coaches decide if the team is stronger with A playing in front of B or B playing in front of A. Same decisions apply to placement on the left side vs. right side. So rather than this being seen as a problem for one team, it should be seen as something every coach faces. frank schoon replied, January 18, 2019 at 6:40 p.m.
Bob Ashpole replied, January 19, 2019 at 8:51 a.m.
You would think so Frank. You would also think that backs can man mark and tackle too. Conventional coaching for youth has emphasized zone defenses for so long and so much that some people don't even know the difference between man to man and zone any more. I believe in the basketball convention of teaching man to man first, then zone. It isn't so much that USSF says to youth coaches don't teach man marking--they don't mention it at all. In fact they don't label what they do push as a "zone" defense. They just call it defending. The other practice I hate is calling backs "defenders" instead of backs. Virtually everyone does it including Soccer America. No wonder Dutch Style principles are not followed any more. I think the problem with "the lack of depth" is early specilization in one position on teams that also restrict player movement. It is the same type of coaching philosophy that results in 1 footed players. It happens when winning matches is given priority over player development. I have never heard of a basketball player who couldn't defend against moves to both his left and his right. Bob Ashpole replied, January 19, 2019 at 9:02 a.m.
One person explained that the reason that they wanted left footed players on the left side was because they thought there was a lesser chance of the player kicking the ball out of bounds using his left foot. My first thought is why select someone who cannot accurately pass for any position. I used to get frustrated with right footed amateur players who never passed to their right. (They would only use the inside of their right foot.) There really is no excuse for developing players who lack fundamental skills, but many youth coaches don't teach all the fundamentals. frank schoon replied, January 19, 2019 at 11:51 a.m.
Bob,...Hey, whoever that person was that explained about ..why leftfooted players and kicking out bounds,..I hope he wasn't a coach. Good grief, LOL. The problem with soccer is that its trendiness and trends as we know, sooner or later, fall by the wayside for soccer continually changes as technique and tactics. And you're right this zonal defense has worked to the detriment of man to man defense. And in addition, the backs have lost the art of defending a winger who goes down to the endline and doesn't cut in. Furthermore, these backs forget how to tackle and specifically if the leftback is leftfooted and the leftfooted rightwing cuts , the won't tackle for it is difficult for a leftfooted leftback to tackle with his right. This is why it is so important to know which footed the centerback is for he is right footed the attacker should try to go by the centerback's leftside. A smart coach like Cruyff sees how the backs play, their movements and their weaknesses. One of their weaknesses is the backs are not used to playing against a wing that goes down the endline,for a cross or cuts inward. As a result if the wing goes down towards the endline the nearest centerback is pulled away from the center to support the back, in case he gets beat 1v1. This particular movement by the centerback,pulling out of the center thus creating more open space is not seen when the wing cuts inside. frank schoon, January 19, 2019 at 12:06 p.m.
As I stated before, coaches are not creative and follow trends or wait to copy other coaches. I will guarantee you if Guardiola, goes back to the old fashioned winger, right footed on rightside and vice versa, you will see other coaches follow. Then you have to ask yourself why couldn't these other coaches do this on their own, instead of having to wait for someone else to do it. I also fully agree with you that you first teach man to man defense FIRST, and by the way even if you play zonal, in the end you have to be able to stop your opponent, man to man, once he's in your zone and has to go with the ball. Now with the lack of depth thing.. Using wings as backs is one way of improving defense/offense. As far as being able to play with only one-foot, I ask, where are the DA programs on this??? for parents pay thousands of dollars over the years. Of course the kid should work on own on his weakfoot, but it is up to these academies to further exploit the weak foot to the point the player is able to use both feet... It seems like these soccer academies are into team aspect instead of developing the individual player..